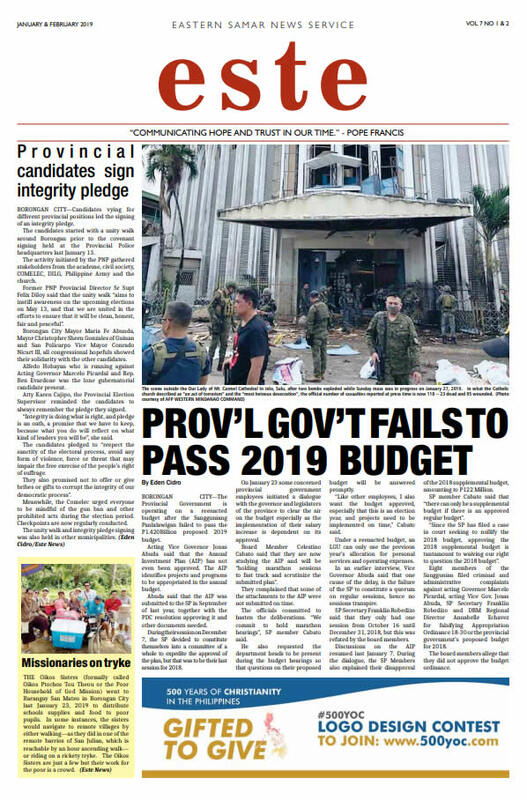 BORONGAN CITY, January 13, 2019—Candidates vying for different provincial positions led the signing of an integrity pledge. The candidates started with a unity walk around Borongan prior to the covenant signing held at the Provincial Police headquarters last January 13. The activity initiated by the PNP gathered stakeholders from the academe, civil society, COMELEC, DILG, Philippine Army and the church. 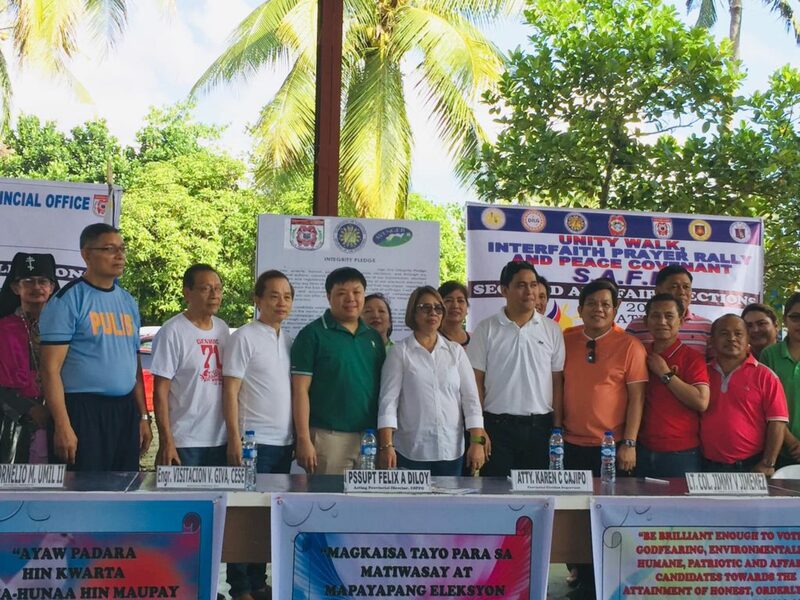 Former PNP Provincial Director Sr Supt Felix Diloy said that the unity walk “aims to instill awareness on the upcoming elections on May 13, and that we are united in the efforts to ensure that it will be clean, honest, fair and peaceful”. Borongan City Mayor Maria Fe Abunda, Mayor Christopher Sheen Gonzales of Guiuan and San Policarpo Vice Mayor Conrado Nicart lll, all congressional hopefuls showed their solidarity with the other candidates. Alfedo Hobayan who is running against Acting Governor Marcelo Picardal and Rep. Ben Evardone was the lone gubernatorial candidate present. Atty Karen Cajipo, the Provincial Election Supervisor reminded the candidates to always remember the pledge they signed. “Integrity is doing what is right, and pledge is an oath, a promise that we have to keep, because what you do will reflect on what kind of leaders you will be”, she said. The candidates pledged to “respect the sanctity of the electoral process, avoid any form of violence, force or threat that may impair the free exercise of the people’s right of suffrage. They also promised not to offer or give bribes or gifts to corrupt the integrity of our democratic process”. Meanwhile, the Comelec urged everyone to be mindful of the gun ban and other prohibited acts during the election period. Checkpoints are now regularly conducted.